The impregnation behavior of molten 2LiF–BeF2 (FLiBe) salt into a graphite matrix of fuel elements for a solid fuel thorium molten salt reactor (TMSR-SF) at pressures varying from 0.4 to 1.0 MPa was studied by mercury intrusion, molten salt impregnation, X-ray diffraction, and scanning electron microscopy techniques. It was found that the entrance pore diameter of the graphite matrix is less than 1.0 µm and the contact angle is about 135°. The threshold impregnation pressure was found to be around 0.6 MPa experimentally, consistent with the predicted value of 0.57 MPa by the Washburn equation. With the increase of pressure from 0.6 to 1.0 MPa, the average weight gain of the matrix increased from 3.05 to 10.48%, corresponding to an impregnation volume increase from 2.74 to 9.40%. The diffraction patterns of FLiBe are found in matrices with high impregnation pressures (0.8 MPa and 1.0 MPa). The FLiBe with sizes varying from tens of nanometers to a micrometer mainly occupies the open pores in the graphite matrix. The graphite matrix could inhibit the impregnation of the molten salt in the TMSR-SF with a maximum operation pressure of less than 0.5 MPa. 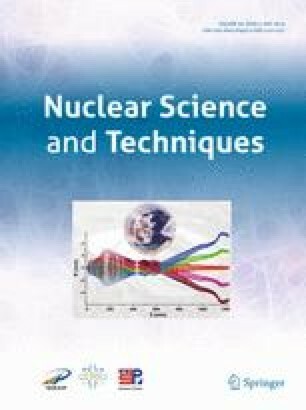 This work was supported by the Thorium Molten Salt Reactor Nuclear Energy System under the Strategic Priority Research Program of the Chinese Academy of Sciences (No. XDA02030000), the Frontier Science Key Program of the Chinese Academy of Sciences (No. QYZDY-SSW-JSC016) and the State Key Laboratory of Particle Detection and Electronics (No. SKLPDE-KF-201811).